Pitcher plant (Nepenthe) is a tropical plant that will be sure to attract attention with its unusual red, purple, and black funnel-shaped pitchers. A carnivorous plant, the pitcher plant gets much of its nutrition from insects who are attracted to the pitcher plant because its the sweet, sticky nectar. Once the unsuspecting insect lands on the slippery rim of the pitcher, it will fall in the pitcher where it will drown in a soupy digestive fluid. Pitcher plants are sometimes called "monkey cups," because in the plant's natural environment, monkeys sometimes like to drink the sweet fluid in the pitchers. Plant the pitcher plant in a low fertility planting medium such as sphagnum moss, peat moss, chopped bark, perlite, or any combination of those materials. Jiggle the container gently to settle the planting medium around the pitcher plant. Don't tamp the planting medium down around the plant because you risk damaging the roots. Water the pitcher plant deeply after planting. Place the pitcher plant in dappled or filtered shade, such as sunlight filtered through a sheer curtain or a window shaded by tall trees. Grow lights will work, as long as the pitcher plant is placed several inches away from the light. If the pitcher plant appears spindly or weak, it probably needs to be moved a bit closer to the sunlight. Keep the pitcher plant consistently moist. Water the pitcher plant with distilled water, as tap water contains salts that can eventually damage the plant. 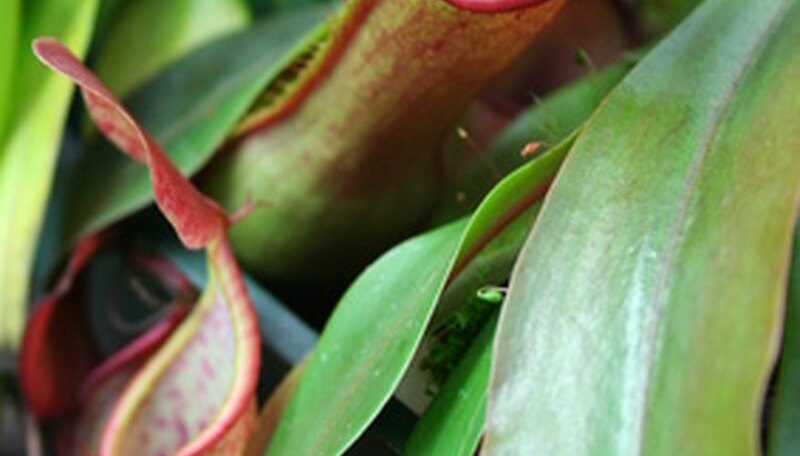 Provide a humid environment for the pitcher plant, as dry air can cause the plant to stop developing new pitchers. Put the plant in a plastic bag occasionally, or plant it in a terrarium. Locating the plant in a humid room such as a bathroom or kitchen is also helpful. Place the plant outdoors during warm, humid weather. Keep the pitcher plant in a warm room with temperatures between 55 and 90 degrees Fahrenheit. Nighttime temperatures shouldn't fall below 55 degrees Fahrenheit. Feed the pitcher plant a small fly if it's placed where it can't catch insects for long periods of time. Place the insect in a mature pitcher. If you prefer, you can mix 1/8 tsp. of water-soluble houseplant fertilizer in a quart of distilled water and pour the mixture in the pitcher until the pitcher is 3/4 full. Use fertilizer sparingly, and only when the plant can't catch its own food, as too much fertilizer can burn the plant. How Does a Venus Fly Trap Work? What Are Some Ways That a Venus Fly Trap Can Die?